Shine a Light: Foodie Heaven .. and we've just started! Foodie Heaven .. and we've just started! Me and the Captain enjoying our lunch at 'Get Shucked'! Our night spent in the little 'Duckpond' bay ... one of the many bays up and down the D'Entrecasteaux Channel ... was calm, peaceful and a great first night back on the boat after our car adventures. 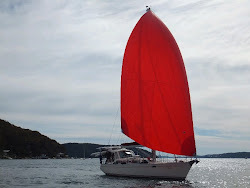 Yesterday we moved to Missionary Bay which is an easy sail around Kinghorne Point on North Bruny Island. We planned to find the oyster farm 'Get Shucked' for afternoon snacks but arrived too late. As we sailed down the Channel the wind was rising to its forecasted high of 20 knots. We only had the headsail out which was pushing us along at a great speed of 6.5 knots with gusts blowing up to 25 and then 26 knots. My favourite way to sail! Just the headsail up with the wind blowing hard enough at just the right angle to move us along at a good pace - without the boat heeling too far over. I've said it time and time again .. I'm not much of a sailor. I prefer the boat upright. The Captain, on the other hand, would love to have every piece of sail flying winched in tight with the gunnels in the water! Keeping us both happy - and the boat moving - is our constant balancing act. When we rounded the corner and started our move into the 'Great Bay' we came upon the largest salmon fish farm we've seen so far. In fact it was in the process of being moved across the bay. Floating fish farm with the towing and pushing boats working. As we sailed past George thought he saw a number of divers working along the perimeter but on closer inspection we realized we were seeing seals! They were circling the nets like wild lions in Africa .. on the lookout for tasty escapees to snap up if any made a break for freedom! By the time we moved into our place in Missionary Bay it was too late to try and find 'Get Shucked' so we had a late lunch followed by George's considerably long nap and some heavenly quiet reading time for me. George, the "chef", making a night time treat of banana + blueberry muffins. They were the best he's done yet!! This morning we woke to a drizzly day and, at one point, a very loud thunderstorm overhead. But the intrepid sailors .. and oyster hunters .. were not to be deterred! With the rain pouring sometimes and at other times just drizzling enough to get your head wet .. we started out across the 'Great Bay' to find 'Get Shucked' and the "Bruny Island Cheese Factory". We managed to find the other side of the bay through the white mist as well as a public mooring we didn't know existed and once safely moored we jumped in the dingy ... with all the wet weather gear we had! Since we've owned "Southern Belle" with her hard dodger we haven't had any reason to wear much wet weather gear. A jacket is only needed when going forward and even then it's pretty much just George that does that .. but today, to stay reasonably dry, I put it all on and needed every bit. I was quite a sight walking into the lunch deck of the oyster farm draped in my dripping wet outer gear .. but no one seem to notice. If you're coming down to Tasmania you MUST give "Get Shucked" a try!! I don't really like oysters much .. George loves them. But I had the BEST oysters I've ever eaten. George had a dozen naked oysters with a glass of Tasmanian Chardonnay and I tried the Asian panko crumbed with rice noodle salad. Fantastic!! We went back for seconds as well .. they really are good. Panko crumbed oysters .. a must try! I had a dozen!! We followed that with another dingy ride in the rain to the Bruny Cheese Factory .. good place and great cheese, from what we could see. Unfortunately there were a lot more people there and it was hard to get to the counter to order or try. Right now we're back on the boat with the expected SE change blowing outside and a new round of rain tapping on the deck. Perfect for another great night's sleep. Tomorrow we plan to sail around to the little town of Cygnet where there is a well known folk festival on this weekend. We've heard most of the tickets are already sold for the scheduled performances but there should be a lot of street activity and buskers to enjoy. Next time you make it back here, if it's oyster season, you must try some of the Appalachicola oysters - from FL just above Panama City. They are bite sized, and taste like the ocean. I never ate oysters until just after you moved to Australia, but OMG I have tried to make up for that ever since. I can't stand the enormous ones that they vacuum pack from Washington State - those things are the size of - well - they are nasty big and full of oyster poo and just disgusting, even in a baked casserole. My cousin came up from PC one time with a bushel of the little delicious morsels and we were at my uncle's farm trying to pry them open with a screwdriver because it was Thanksgiving and they forgot the oyster knives. They were worth all the bloodshed!